• Categorized under Business,Legal | What is the Difference between Executor and Trustee? When discussing the difference between Executor and Trustee, it would be necessary to understand a few preliminary terms to gain a clear understanding. The first term is what is known as a Trust. To be clear, a Trust is simply a legal fictional entity created for the purpose of holding and owning assets for the beneficial interests of those who granted the ownership of these assets into the trust. These people are known as grantors. Although there are many different types of Trusts, for this purpose just accept that a trust is a trust is a trust. It owns the assets; it can have a legal tax ID separate from the grantors of the trust. One of the purposes is that a trust has perpetuity where the living human being known as the grantor has mortality. For the purposes of explaining the terms, we will use what is known as a Revocable Living Trust. Embedded in a Revocable Living Trust are different sections which can include medical power of attorney, a will reflecting interests of the grantors upon their death, financial or medical power of attorney, and list of assets owned by the trust and so forth. Now even though Trusts are considered legal entities, they cannot make decisions on a daily basis as it has no brain. Therefore what the trust needs is a real human being who can think and manage the Trust. That person is called the Trustee. 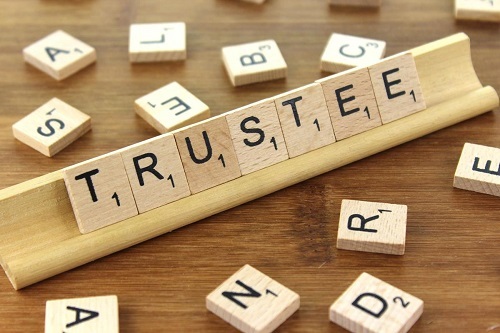 Think of the Trustee as the real live person with a brain that takes care of moving assets into and out of the trust for the beneficial interest of the beneficiaries of the trust. Think of the Trustee of a Revocable Living Trust as the person(s) who can change the terms of the Trust including the various sections such as the will, power of attorney and so forth. In many cases, the beneficiaries are in fact the grantors of the trust, and there is no reason that the grantors and beneficiaries of the trust could not also be the Trustee. For example, suppose that a married couple wanted to create a Revocable Living Trust. This is the Bill and Helen Revocable Living Trust. So Bill and Helen would be the Grantors of the Bill and Helen Revocable Living Trust. They would retitle their assets into the Bill and Helen Revocable Living Trust. This Trust would now operate as a legal entity that owns the assets in their newly formed Bill and Helen Revocable Living Trust. In addition to this, Bill and Helen could and probably would act as the Trustees of their Bill and Helen Revocable Living Trust. They could move assets into and out of the Trust, change beneficiaries, change the terms of the Will, Medical Power of Attorney and so forth. Hence the revocable part of the Trust. However, suppose that Bill passed away leaving only Helen. Embedded in the Trust documents would be something known as Successor Trustee. Both Bill and Helen would be each other’s successor Trustee for the purpose of continuing the management of the Bill and Helen Revocable Living Trust. However, what would happen if both Bill and Helen passed away? They would be considered the decedents of the Bill and Helen Revocable Living Trusts. This situation would now create a scenario in which the Bill and Helen Revocable Living Trust no longer has any Trustee. In other words, there is no real human brain managing it. Within the Trust documents there would have been named an Executor. This is typically a person who is named in the trust to “execute” the terms of the trust to the primary or contingent beneficiaries. This of course would most likely be their children, grandchildren or favorite charity. This could be any beneficiary who is named in the trust documents to be a recipient of the assets within the Trust. So, the Trustee, or Successor Trustee in now out of a job because once the owners of the trust pass away, the terms of the trust have to be executed and distributed to the named beneficiaries. That is exactly how these Trusts operate, although the nuances of each trust can become complicated depending on the size of the estate and other trusts or financial assets that exist outside of the Revocable Living Trust that were owned by Bill or Helen. So to clarify, a Trust is a legal fictionalized entity that owns assets. A grantor is the person who grants their assets into the trust. A trustee manages the trust while the owners of the trust are still alive. An executor replaces the trustee upon the death of the last beneficial owner of the trust and executes the terms of the trust to the stated beneficiaries. We hope that this very brief information has been of educational benefit to you. For more detailed understanding, we encourage you to contact your financial advisor or your estate planning attorney for anin-depth understanding of your particular and unique situation. Betty Norris. "What is the Difference between Executor and Trustee?." DifferenceBetween.net. December 19, 2016 < http://www.differencebetween.net/business/what-is-the-difference-between-executor-and-trustee/ >. Your explanation of what is an executor is absolutely wrong and misleading. An executor is named in a WILL to carry out the wishes of the decedent; an executor has nothing to do with a trust unless the will names the executor as trustee ALSO. An executor has nothing to do with a trust unless so designated in the will. A person may have both a will and a trust and the executor may not be the same person as the trustee. Terrible explanation.